Another round of pretzels and beer! This is the pretzel chair that gets all the attention—perhaps because George Nelson already had a name for himself when he designed this. He is the creator of the Nelson Coconut Chair. 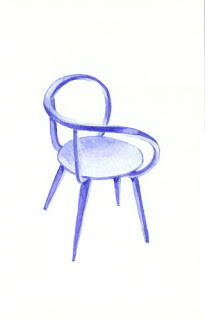 (chair #107, April 17 of this blog). Interesting how the arms of this chair curve around and under the seat.